Liverpool super-striker Luis Suarez reportedly plans to quit the club at the end of the season, with Spanish newspaper Marca claiming that the Uruguayan has decided to leave England altogether. In a report that will send chills down Liverpool fans worldwide, Marca say that Suarez will leave the Premier League this summer, despite only signing a new four year deal at Liverpool in December. Suarez has been in scintillating form this season, scoring 28 goals and bagging 22 assists so far, and has led Liverpool to within a point of Chelsea at the top of the Premier League with only seven games to play. But Marca seem convinced that the 27-year-old will leave the club this summer, and have ruled out a move to another Premier League side, including money-bags Manchester City. There will be plenty of sceptics concerning this report however, with Marca known to be a pro-Real Madrid publication. The Spanish giants were known to be interested in Suarez last summer, and this article points only to a move to Madrid, despite a plethora of other suitors. Arsenal are also fans of Suarez, and bid just over £40m for the attacker last July, but were rebuffed by Liverpool, who eventually persuaded their star man to stay at the club. Marca’s latest gambit concerning the future of Suarez should therefore be taken with a pinch of salt, as it could well be an attempt to stoke the fires ahead of the summer transfer market. Arsenal and Manchester United in race for Griezmann? who cares, Liverpool is more than Suarez. LOL! Liverpool minus Suarez = mid table obscurity!!! If Suarez really wants to leave then no one can stop him, liva will have to look for a replacement and thats where they should buy AGUERO. 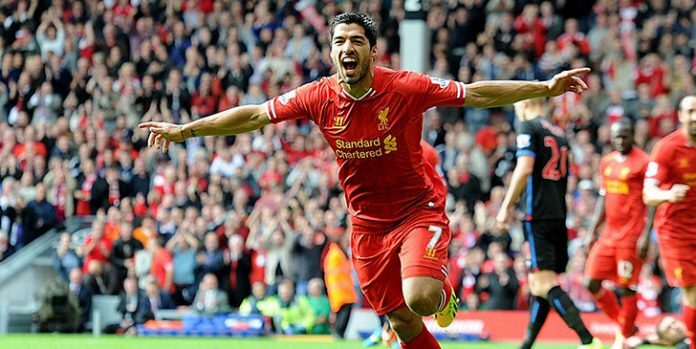 Suarez wants Liverpool to increase his wages not only to leave the club. Suarez is too big for a small club like Liverpool! He should play for giants like Real Madrid or Barca. Liverpool can spend the 100 mill to bring back Andy Carol! I am fans from Tanzania , I would like our Liverpool management to find instantly news player like Suarez but first of all in my dreams in laliga Spain there is good player.rather other country and BuBundasliger otherwise congratulation for all player especially Gerald, Suarez , sturege continah and others. Thank you.